24H recording Steps, calories and mileages. Reminds by vibration when you need to move and relax after sitting a long time. Clock, Calendar, Vibration, Wake on screen, Time, Brightness, Personal information. Walking / Running / Climbing / Swimming / Riding / Treadmill / Basketball / Badminton / Football Mode. Equipped with temperature sensor and air pressure sensor, view the real-time data at anytime and anywhere. QUICKLY CHECK YOUR FITNESS STATUS : Steps, distance, calories burned, heart rate; and record data both in smartphone App and watch. It also tracks your sleep. All these functions are wrist-based and easy to use. GET YOUR INFORMATION AT A GLANCE : Check what's important-like calls, text, and alerts-just like you check time. Download and install the APP(HPlus) then connect the smart watch to your phone via Bluetooth so you can read push messages in the smart watch. ACCOMPANY YOU WITH EVERY ADVENTURE : Build-in altitude, temperature and pressure sensor to accurately measures each mountain you have climbed. It also supports multi sport mode: running, cycling, climbing, badminton, football, basketball and treadmill. It records and helps you build a healthy sport habit. 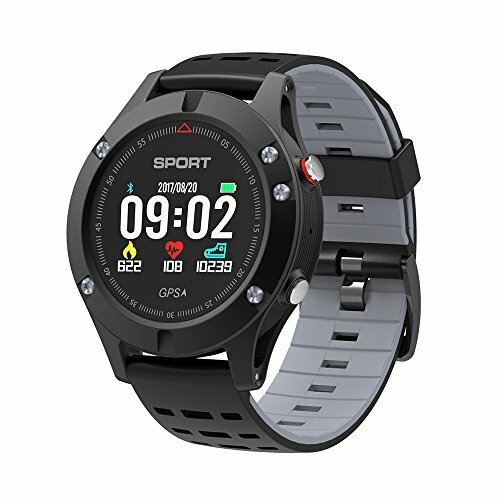 WATERPROOF IP67 LEVEL : Stoga F5 smart watch has passed strict professional testing to resist water in daily use, including shower, washing dishes and during outdoor activities. WARRANTY FREE : Stoga promise 60days FULL MONEY BACK GUARANTEE and 7*24h customer service. Please feel free to contact us and we would serve you ASAP.